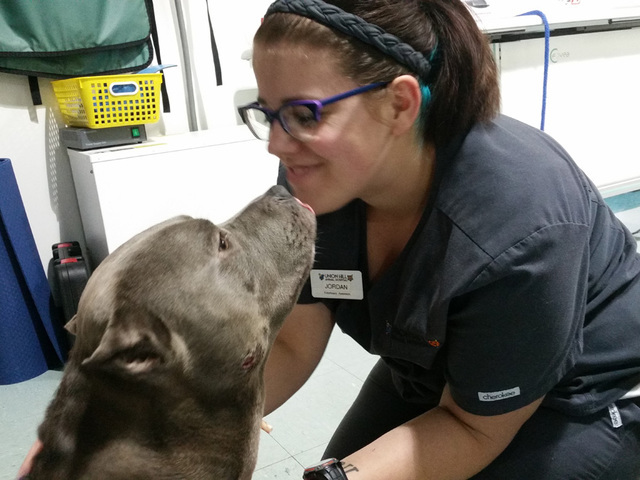 A pit bull is being credited this week with defending a homeowner during an attempted robbery in Kansas City, Mo. The homeowner says the pit bull, named “Blue,” defended the home during a robbery attempt Thursday on the 2000 block of E. 82nd Street. Boonville Mayor Julie Thacher’s vote broke the tie (four to four) to ultimately approve the new dangerous dog ordinance, which releases a ban on pit bulls in Boonville. Boonville Mayor Julie Thacher’s vote broke the tie (four to four) to ultimately approve the new dangerous dog ordinance, which releases a ban on pit bulls in Boonville.Several individuals who were in favor of the removal of breed specific legislation told the council reasons for this favor at the council meeting Monday evening. Individuals representing the Great Plains SPCA said they were asked to come to support local animal advocates. They also said they believe that environment rather than breed is a factor in behavior development.Boonville resident Mike Kelley said he wanted the council to keep the ban on pit bulls, which he believed would be the right thing to do. An amendment by Boonville Ward Four Councilman Mark Livingston added that any animal taken from the owner could be given to a non-for-profit state licensed rescue organization. He also added language that prohibited any dog that showed signs of aggressive behavior towards a human or a domesticated animal. The amendment passed, seven to one (Boonville Ward Four Councilman Henry Hurt voted against). After a failed attempt to re-insititue the pit bull ban into the ordinance by Boonville Ward One Councilman Steve Young, the ordinance went for a final council vote. Boonville Ward Two Councilwoman Vanessa Dorman, Boonville Ward One Councilwoman Kari Evans, Young and Hurt voted against. Boonville Ward Two Councilwoman Susan Meadows, Boonville Ward Three Councilman Ned Beach, Boonville Ward Four Councilman Mark Livingston and Boonville Ward Three Councilwoman Becky Ehlers voted in favor of the ordinance. The tie was broken by Thacher as she voted in favor of the ordinance. The ordinance, according to city officials, holds the dog owner more accountable than previously. A new tethered law is also enacted, which states a dog cannot be on a tether for more than 11 hours. Animal advocates from the SPCA and other organizations believe this new ordinance will make it more manageable for Boonville Animal Control Officer Pam Paxton. The council also voted to approve the new animal control administrative fees. The new ordinance defines a vicious dog as any animal that has caused death or serious injury to a person. It is also defined because of size, physical characteristics and vicious propensities of being capable of inflicting serious physical injury. Animals that have been trained to fight or is kept for the purpose of fighting are also prohibited. The complete ordinance can be reviewed by picking up a copy at Boonville City Hall on Main Street. Firefighters needed an ax and a pike pole to pry the snarling pit bull off of 71-year-old Jimmie Mae McConnell’s torn and bloody body. That fatal dog attack in 2006 led to calls for tougher enforcement of the now-24-year-old pit bull ban in Kansas City, Kan., while prompting other area cities to tighten their restrictions on a breed known for its muscular build and savage bite. Yet thanks to research that shows little correlation between fatal dog bites and the breeds of the dogs inflicting those wounds, the Unified Government of Wyandotte County and Kansas City, Kan., is now considering what would have been unthinkable a few years ago. Unified Government commissioners this month will take up a comprehensive animal-control ordinance that repeals the ban on pit bulls. Instead, the proposed policy would impose new rules and restrictions aimed at preventing dog attacks without regard to breed by focusing on the behavior of animal owners and their pets. The city of Roeland Park is considering becoming the latest area municipality to lift its pit bull ban. Some council members believe it makes more sense to have a ban on dangerous animals rather than a breed specific ban. In January, Bonner Springs lifted its pit bull ban. Kansas City allows pit bulls, but they have to be spayed or neutered. Independence and Kansas City, KS ban the dogs. Kellie Maschmeyer hopes Roeland Park joins the effort to outlaw the bans. She had to give up her 4-year-old dog, Chloe, when she moved to Roeland Park in February because of the pit bull ban. “I was horrified because we had been looking at other places to live and most of them don’t have the pit ban,” she said. “(Giving up Chloe) was the hardest thing I’ve ever had to do.” Maschmeyer, who had owned Chloe since she was 11 weeks old, said pit bull owners are not a danger to society and deserve to have their dogs. She said she’s been bitten by a boxer and border collie. Councilwoman Jennifer Gunby proposed lifting the breed specific restriction, which has been on the books since the late 1980s. Opponents of the ban say even little dogs can be dangerous. A council committee could discuss the change on Oct. 6 and then the council vote the following week. The proposal includes other changes to the city’s regulations of dogs and would adopt feral cat language. Currently, anyone in Roeland Park with an American pit bull, American Staffordshire terrier or Staffordshire bull terrier face a fine of $200 to $500 and up to 30 days in jail. Each day is considered a separate violation. The city will also impound any pit bulls. KANSAS CITY, Mo. — For much of the past three decades, pit bulls have been widely regarded as America’s most dangerous dog — the favorite breed of thugs, drug dealers and dog-fighting rings, with a fearsome reputation for unprovoked, sometimes deadly attacks. Hostility toward “pits” grew so intense that some cities began treating them as the canine equivalent of assault rifles and prohibited residents from owning them. But attitudes have softened considerably since then as animal activists and even television shows cast the dogs in a more positive light. The image makeover has prompted many states to pass new laws that forbid communities from banning specific breeds. And it illustrates the power and persistence of dog-advocacy groups that have worked to fend off pit bull restrictions with much the same zeal as gun-rights groups have defeated gun-control measures. Pictures are worth a thousand words, but this one might just leave you speechless. Earlier we posted a picture of Jeffrey, who is blind, and his brother Jermaine, who has dedicated his life to be Jeffrey’s loyal guide dog. Here they are as they sleep, holding on to each other. The unconditional love and devotion these two dogs show is positively inspirational. Jeffrey and Jermaine are STILL waiting at shelter Operation Ava in Philadelphia for their hero to come rescue them! Please open your heart and home to them! For more information or adoption inquiries, please contact Operation Ava at (215) 240-1240 or visit their website www.operationava.org.